If you love to quilt, or just want to see beautiful, artistic work, don’t miss the Annual Quilt Show in the San Luis Valley. We (Debbie and Neal) attended this event on the weekend of June 24, 25, and 26, 2011. This was the seventh year for the show which is held at the Inn of the Rio Grande east of Alamosa on Highway 160. Admission is free but donations are greatly appreciated. During this same time period, you will also see many quilts displayed in store fronts along Main Street in downtown Alamosa. 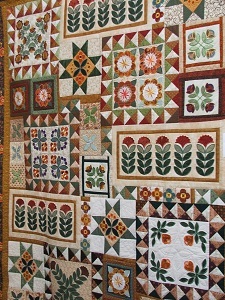 The Quilt Show has been an ongoing organization in the San Luis Valley for 20 years. The quilt group has approximately 60 members from all over the San Luis Valley. They meet once a month on the third Saturday in Monte Vista. Their membership dues are $15.00 which includes a monthly newsletter. The group includes quilters who are experienced, novice and beginners. 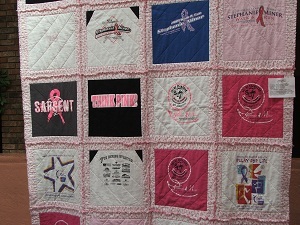 It is not a competition between the quilters, but instead a support group who enjoy and encourage one another. This year’s show featured both experienced and novice quilters displaying their beautiful quilted creations which included bed-sized quilts, wall hangings and miniatures. When we signed in we were given a ballot to vote on our favorite large quilt, medium quilt, small quilt, miniature quilt, and the Challenge quilt. There were so many beautiful quilts; it was difficult to decide on just one in each category. Each year the group chooses a yearly challenge project and this year the theme was “Birds of a Feather”. For the challenge project members are given the same color fabric and quantity. It is their responsibility to create their own quilt block pertaining to the theme of each year. It is amazing to see the originality of each person’s block. 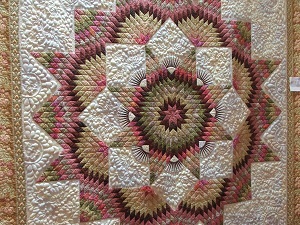 Each of the quilted projects is done by hand quilting or machine quilting. I love the patience and personal touch necessary to hand stitch a quilt, but I love the designs of the quilting machine. The back of a quilt often looks as beautiful as the front. There was a gorgeous queen sized quilt which was offered in a raffle. The quilt was appraised at $2,000. The money raised from the raffle of this quilt is used for quilting workshops with nationally recognized instructors, a quilting demonstration day, the annual quilt show, and quilting retreats. I personally have made two quilts with the help of the quilt store in downtown Alamosa, Heartstrings and Heirlooms (formerly the Gray Goose Fabrics). A couple of the women involved also work at the Heartstrings and Heirlooms and are very helpful in coordinating colors and materials. 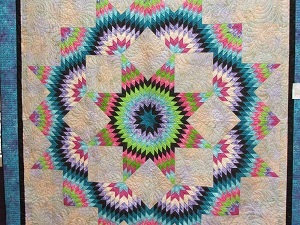 Don’t miss the 2012 Annual Quilt Show. 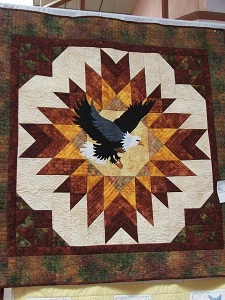 You will be amazed at the beautiful, creative pieces of work done by local quilters of the San Luis Valley.